The MC of the event was Rich Magallanes, Vice President Current Animation Series Production. 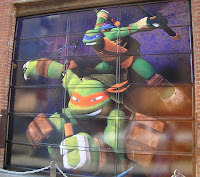 After a brief welcome and introduction, Rich went on to say that with the new series Nickelodeon really wants to incorporate everything from the past 27 years of TMNT history while keeping the integrity of the property and also bringing it to the next level. To achieve this, they want a comic book vibe with an anime feel in a CG animated world. 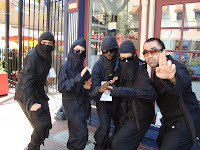 There's going to be a lot of focus on the ninjitsu lifestyle, beyond just the fighting element. 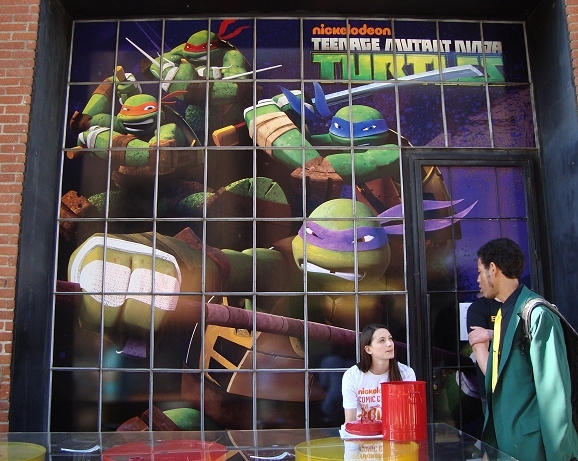 We can expect to see the Turtles fight enemies that are more dangerous, and eat pizza that is "more delicious" (ok...). To help distinguish the four Turtles from each other better in the eyes of the general public, different looks and personalities have been crafted for each Turtle (I know, I know). 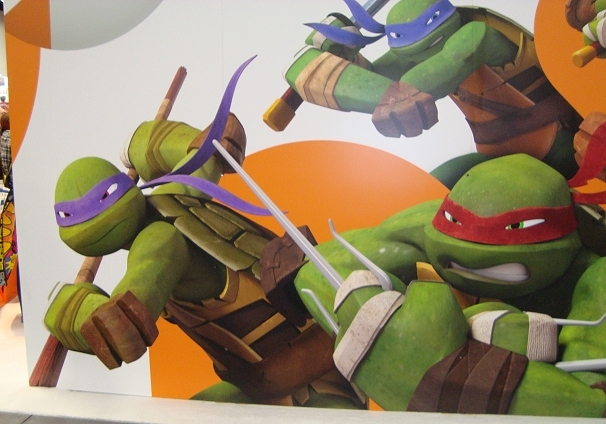 They also wanted to make the Turtles more relatable as teenage brothers. Instead of being big and bulky as they have been in many past iterations, these Turtles are more like high school football players. Next Rich moved on to reveal each Turtle's look and tell a little about their personality. Leonardo enjoys a cheesy sci-fi show similar to Star Trek, and idolizes the Captain character in the show and envisions himself in that role. He's always eager to lead a mission, but when he turns around, all he sees is the Three Stooges behind him. Leo is voiced by Jason Biggs. Raphael is the muscle in the party. He'll give a fist in the face first, and ask questions later. There's a bit of a rivalry with Leo about being leader, and he probably could be a pretty good leader if he wasn't such a hot head. 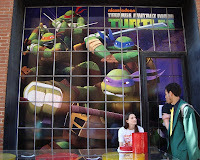 Raph is voiced by Sean Astin. on the TMNT USB stick. Donatello is the science guy. Like a ninja would anyways, Don is quick to be able to use his existing surrounds, such as scrap metal, to throw things together and adapt to the environment/situation. He builds all the vehicles and weapons. And he's got a little bit of a crush on April, which the other guys tease him about. As you've seen in the newest picture, Don is gap-toothed. I didn't recall this from the event in March, but Mikey P. says he remembers it being there and I trust him. Don is voiced by Rob Paulsen. Michaelangelo is the most creative, wild, and the comic relief. He comes off as being a bit silly, but you don't want to mess with him because he will beat you up if he needs to. 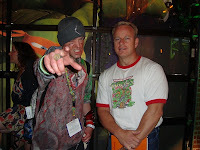 Mikey is voiced by Greg Cipes. Next, a chest-up CG image of Splinter was shown. This was something new since the preview event last March, where we only saw concept drawings. Instead of being small, old, and frail, this Splinter is a bit younger, more agile, and a bit taller. He's still the sensei and father figure. Expect to see him engaging with the Turtles more in terms of training and sparring sessions (and above ground stuff seemed to be implied, too). All of these changes also help to make him more of a better opponent against Shredder. Expect to eventually see a Splinter and Shredder showdown. 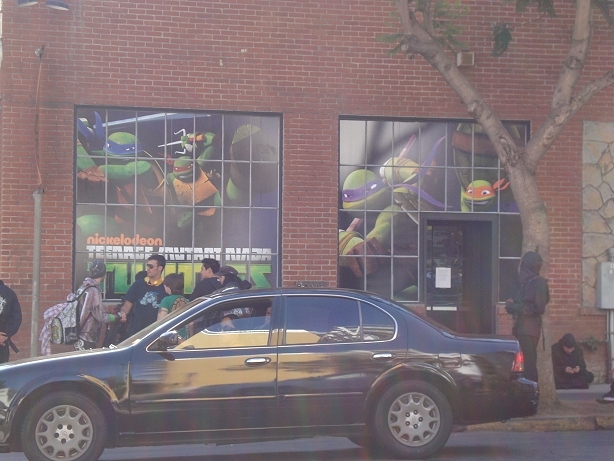 the Gaslamp about the TMNT event. Next was April, who was a full figure CG image, which was also new since the March event. It looked like her design had been tweaked just a little bit, like she might now be a little bit taller. And I'm pretty sure I remember her having leggings and a skirt back in March; here she had leggings and jean shorts. Nickelodeon thought it was "pretty creepy" that a 30-ish woman would hang out with four teenage turtle boys, so she's been aged down to 16. She will eventually be trained by Splinter to become a kunoichi, or female ninja. Next, some of the bad guys were revealed. An image (just a drawing, not CG) of one of the Kraang was shown, which is this show's version of an Utrom. They've come to Earth with the goal of colonizing it, but they haven't yet perfected the technology to adapt to our atmosphere, so they were exo-skeleton suits. They apparently walk a little funny and talk a little funny. They will be joining forces with Shredder and will eventually build him robotic ninjas. Side view of the event venue. Which brings us to the Foot Clan. Some Foot Soldier designs were shown, which are pretty similar to the original movie Foot Soldier look. While the Foot Soldiers aren't "bumbling idiots" and they are a force to be reckoned with, they will also be providing a little more comedy so that it can be emphasized exactly how much of a badass Shredder is, because they aren't holding back on Shredder at all. The Foot Soldiers will have a range of motorcycles that they use to get around the City. These are huge dragsters. When they're out these things they're not trying to sneak up on you; they're announcing their arrival and telling you to get out of their way. Next, the "Stealth Shell" (my name, still not 100% sure on the actual name) was revealed. This is the single-driver vehicle that can go in and out of a camo armor mode. 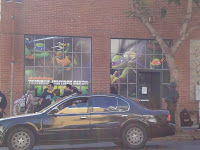 Next was the Party Bus, the Turtles' primary vehicle, which is a subway car that Don converted. It's decked out in armor and has street wheels that can pop up and out so it can go top side. But then pull the wheels back and it can go back to the tracks down below. The next topic was the Turtles' weapons. This was pretty much what you would expect. Although Mike still has his nunchucks, they'll be able to transform into a kusarigama. 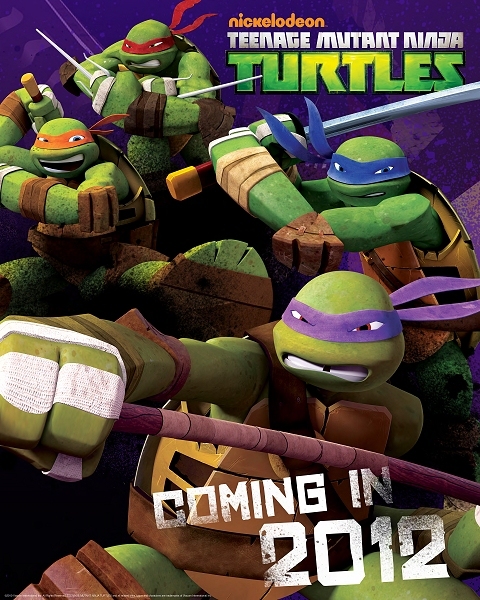 And Donatello's bo will also be able to transform into a naginata. New York, of course, is their home and playground. While developing such a massive city is a lot of work to do in CG, but they are working on making it as big as possible. Expect it to look "hip-hop" and "grunge." Some concept designs for China Town and April's apartment (with the antique shop below) were shown. Then, finally, the design for Shredder was revealed. I think he might have been a full-figure CG image, but I'm not 100% sure. However, his design was still the same from the March event, thus he is still very badass. He's not corny, cheesy, don't expect him to be busing out jokes. He has his mind set on only one thing, and that is to destroy Splinter and the Turtles. And with that, the PowerPoint portion of the event was over. hang out after the presentation. Rich then brought Pat Linden, Vice President of Marketing at Playmates Toys, up on stage to talk about and reveal some of what they've got in the works. 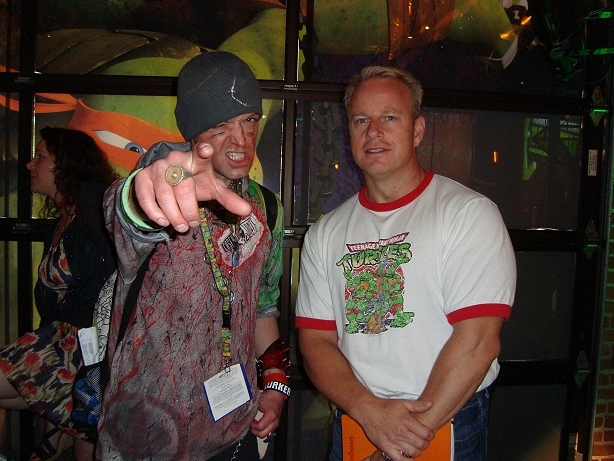 He talked a little bit about the extraordinary sales records that Turtles toys have, including the statistic that in 1990 Target sold more TMNT action figures than they sold Snickers candy bars. He then revealed two displays of toys. The one on the right side of the room featured a bunch of the vintage action figures, and the one on the left side of the room showed the four Turtles, Shredder, and I think some of the vehicles. 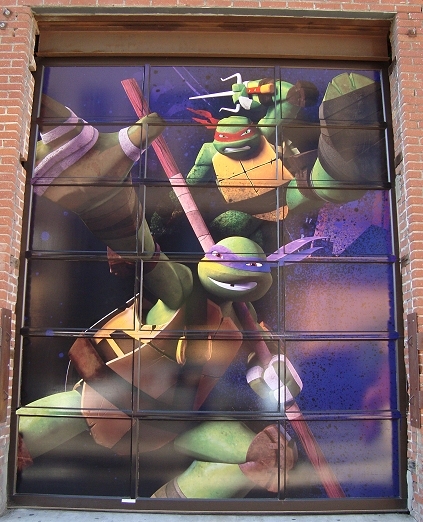 The four Turtles were the same as they had been in March, while Shredder was now fully painted (he hadn't been back in March). On stage to Pats's right was a weird glass box thingy that had so far been ignored, but now a rotating 3D image of the Shredder figure was being projected inside of it. It was actually really quite cool. Next on stage was Bobby Curnow, an editor at IDW. He took a little time to talk about the upcoming series, though there was really no new information to offer. Brought up on stage next was the creative team behind the new TV series: Executive Producers Joshua Sternin, Jeff Ventimilia, and Ciro Nieli. Rich asked the panel a few questions, which I think was pretty similar to what we heard from them in March. Josh has been studying martial arts for a few years, and while he claims that he isn't very good, his sensei (who started martial arts himself because of the TMNT way back when) is, and he'll beat Josh up if he screws up this project. 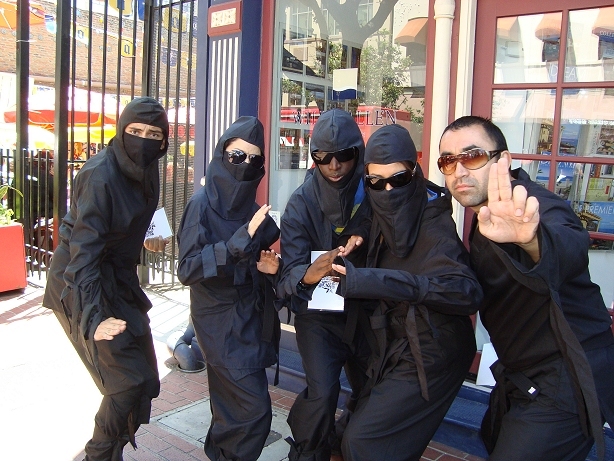 Jeff talked a bit about their goal of mixing up the comedy element with the ninja action. Ciro talked about being a long-time fan, starting with buying the original comics, and about how he really wanted to draw a lot from the first 10 issues with its mythology and emotional content. Finally, for the end of the program, we were shown a short bit of animation (we saw this back in March). The video starts similarly to the preview video released at the beginning of March, but then extends a little longer to show the Turtles running across some rooftops, and then we see them down in an alley. Raph: "Halt, villain? When did we start talking like that?" Leo: "We're heroes, that's how heroes talk." And that was it! On the way out we were handed a USB drive with the new logo on it (and some PDF files loaded on it), a copy of the IDW ashcan, and a souvenir ticket to the event (we had had to give them up to get in). Many thanks to Nickelodeon for hosting this party! It was especially great to see so many familiar faces. Can't wait to see what's in store for us at next year's Comic-Con! Can we get a few details on the toys? Articulation, scale, etc? Thank you! did they mention anything about the upcoming movie??? I don't like how they look at ALL. 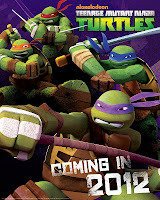 does anyone know if Casey Jones will be in this new cartoon??? Not likely until the second season, but he will show up eventually. Oh, and nothing about the movie at the event. They're still figuring out the script. -->> ..i gotta go back for the 3rd event, so glad too so i could hook Ciro,Joshua n' Jeff up ! !